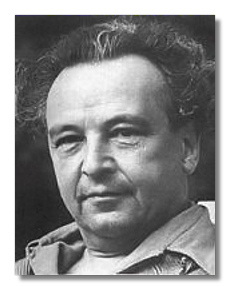 Arthur Honegger, a major early modern influence on French music, was born in Le Havre of Swiss parents and died in Paris in 1955. Commentators – forgetting figures like Saint-Saëns, d'Indy, Duparc, Chausson, and Lalo – frequently point to him as introducing a Germanic strain into French music, by which they seem to mean symphonic argument, high seriousness, and counterpoint. Honegger's earliest surviving music shows the influence of late Debussy, particularly in its lean textures, and an interest in Bach counterpoint. In the 1920s, Honegger became part of the French group Les Six. Along with Poulenc and Milhaud, he is still treated seriously. Jazz and Le Sacre du printemps also get brought into this mix. 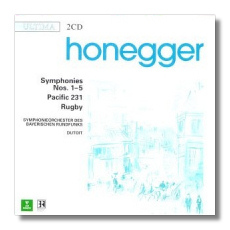 Honegger developed slowly: many years passed before he found his mature style. Accordingly, we have a Ravel-like Prelude to "Aglavaine et Selysette", the Stravinskian Mouvements symphoniques (including Pacific 231 and Rugby), the jazzy cello concerto, and the flip piano concertino. We see this eclecticism all at one go in the oratorio Le Roi David (1921), still one of his most popular works. Here Bach rubs shoulders with Stravinsky, Ravel, and even Massenet. It took Honegger some time to assimilate these strands. Les Six were never all that close artistically and soon broke up into individual careers, although Honegger remained friendly with Poulenc and Milhaud. In particular, Honegger rejected Satie and strove after high seriousness in a way alien to the rest of the group. Where others were epigrammatic, favoring the short, direct, jewel-like statement, he was expansive. He began a long association with Paul Claudel and got caught up in the twentieth-century Christian revival in France. This culminates in his masterpiece Jeanne d'Arc au bûcher, to a Claudel text, but it also comes out in other large-scale works: Antigone, Judith, La Danse des Morts, and Une Cantate de Noël. 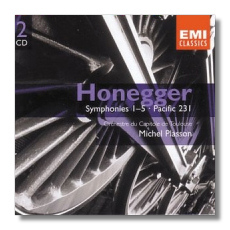 Honegger also pioneered "serious" film music. His scores included those for Abel Gance's masterpiece Napoleon and the 1934 French version of Les Miserables. His inluence on American film music can be seen mainly in the aims and work of Miklós Rózsa. 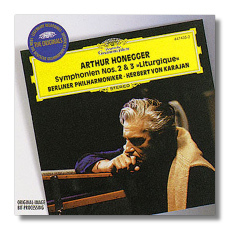 His natural hankering after the big statement and concern for form combined to make Honegger the outstanding French symphonist of the century. He wrote five, the first of which (1930), commissioned by Koussevitsky for the Boston Symphony Orchestra) stands apart stylistically, although it's a fine work, unaccountably neglected. Again, the debt to Stravinsky is much more obvious than in the others, and there was a long gap between the first and the second. The mature symphonies include No. 2 "pour cordes" (begun in 1941, with trumpet obbligato in the last movement), No. 3 "Liturgique" (1945), No. 4 "Deliciae Basilienses" (1946), and No. 5 "Di tre re" (1950). The religious element makes itself known in most of these works (No. 4 is the exception), dramatic pieces which reflect the tragedy of the war and the post-war period. Only the second ends optimistically, with a chorale melody in the trumpet. The third (movements "Dies irae," "De profundis clamavi," and "Dona nobis pacem") is so tortured, it's difficult to find a key. Commentators have seen the fifth as a return to more formal concerns ("the 3 Ds" refers to a repeated D on the timpani which ends each movement), but Honegger himself described the final allegro marcato as a "march of human folly."